UNITED NATIONS, March 24 -- When the UN kills someone, shouldn't they announce it? 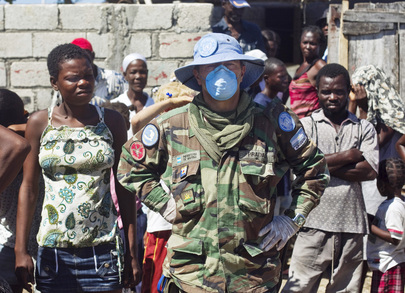 After the elections in Haiti, Inner City Press on March 24 asked Secretary General Ban Ki-moon's spokesman Martin Nesirky about ballot irregularities blamed on the UN system, and about reports of the shooting death of a Haiti by the UN mission MINUSTAH, specifically by a Blue Helmet from Argentina. While Nesirky by that time had an “if-asked” sheet of paper with him, to be read out only if the question was asked, he left unanswered Inner City Press' follow up question: “How does the UN report where it has caused the death of a citizen of the country they are in”? Inner City Press: There are some reports blaming UN or UNDP [United Nations Development Programme] for some missing of 200 and, 2,009 ballots in this most recent one. I am not sure if the UN has a response to that. And there is also, it seems that the Argentine part of the peacekeeping mission acknowledges a role in the shooting of this Haitian citizen. Is that something that MINUSTAH has confirmed and what brought that up? Spokesperson Martin Nesirky: On the first question, I would need to check on the question about the ballots. I would need to check on that. On the second, what I can tell you is that in the morning of the election day, which was Sunday the twentieth, in Dessalines in Artibonite, a group of 50 to 60 unidentified armed men attempted to attack a polling centre. And the UN Peacekeepers who were guarding the centre had no choice but to use force in order to protect the centre and the Haitian civilians who were at threat at that point. And according to the rules of engagement, the peacekeepers used all peaceful means to try to dissuade the group from progressing toward the centre. But the group continued to progress in a threatening way. The peacekeepers issued halt calls and fired several rounds of warning shots. And they were then engaged by the assailants, and had no choice but fire back in self defence, and this was to protect the centre and the civilians. 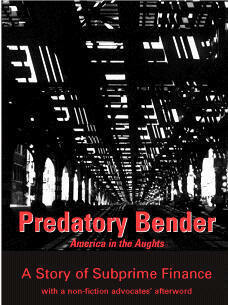 The assailants then dispersed and fled, and the attack was repulsed. The voting process was able to start again. During the exchange of fire, one individual was hit by a bullet and wounded. The peacekeepers provided medical assistance and took the person to the closest hospital, but that person later died from his wounds. And, as it is the case when there is any loss of life, the Mission launches an investigation, and has launched an investigation, to determine the exact circumstances. And I can confirm that these were Argentine peacekeepers. There were four Argentine peacekeepers at this center. Inner City Press: Is there some rule, I mean I, thanks a lot for that, it’s really helpful, is there some, I mean, how frequent is this? How does the UN report where it has had to engage and may have caused, in self-defense or otherwise the death of a citizen of the country they are in? Spokesperson Nesirky: As I’ve said, whenever there is loss of life, then the mission, or any mission, any mission would investigate. Even if the mission “would investigate,” what is the UN system to announce when it has killed someone? And why aren't the results of the investigations made public? After a Haitian teenagers died, allegedly strangled in a peacekeeping base in Cap Haitien manned by the Nepalese, the UN never released its report, and has apparently not waved the immunity of staff member Joelle Rozefort to allow or require testimony. Inner City Press: there was a case some time ago of a boy that was found hung — a Haitian boy found hung in a Nepali base in Cap Haitien. Some say that Mr. Mulet has asked the Secretary-General to remove the immunity of a national staff member there, Joelle Rozefort, so she can testify to a court about this. Is that – one, has Mr. Mulet made the request? But whether he has or not, is the Secretary-General considering removing the immunity of this staff member to respond to a court subpoena? Spokesperson Martin Nesirky: I’m aware of the incident you’re referring to in which someone was found to have been hanged. And I think we may be able to provide you with a little bit more information on the question that you’ve asked a little bit later. But more than two months later, no information has been provided. Watch this site. Ban's son in law Siddharth Chatterjee was in mid 2009 made the Middle East chief of UNOPS. This month, Inner City Press was told by UNOPS sources that Chatterjee quietly left once he was asked for his educational credentials, and after being described by co-workers as “the furniture” for lack of effectiveness. On March 17, after Nesirky during the UN noon media briefing refused to answer a question from Inner City Press by saying it should be dealt with outside of the briefing, Nesirky approached Inner City Press in the UN hallway between the briefing room and the Security Council meeting about Libya. 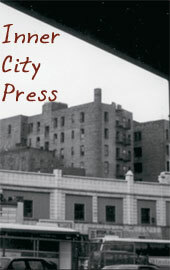 Inner City Press had asked Nesirky five questions, ranging from Sudan and Myanmar to hiring practices, a statement by Ban about UN rubble removal in Haiti which Nesirky's office “amended” with out explanation, and about the impending pay decrease or firing on March 28 of elevator operators at the UN. Just this month, Inner City Press has asked questions about UN labor changes under Ban which are opposed by the UN Staff Union, the International Brotherhood of Electrical Workers, and now the elevator operators, all without any answers from Nesirky. “People don't want to deal with you,” Nesirky said. While the current UN leadership seems unwilling to answer investigative questions, just over the past week for example, the Permanent Representative of India to the UN called Inner City Press to answer a question, and earlier on March 18, the IMF answered Inner City Press questions about Zimbabwe. 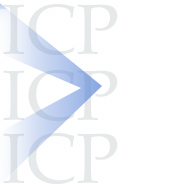 “I'm going to head back to the Security Council,” Inner City Press said turning away, “where people do seem want to deal with me.” During the Libya meeting, Inner City Press got answers from French foreign minister Alain Juppe and diplomats from Lebanon and Libya, among others. Nesirky called after Inner City Press, “if you were concerned about elevator people, I feel for people too.” Saying "I'm choosing my words very carefully here," he continued that he didn't want to criticize the Office of the Spokesperson staff traveling with Ban until he learned why the statement on Haiti had been amended. Inner City Press said while that argument had some merit, given how rare or even unprecedented it is to label a revised transcript “amended” instead of “as delivered,” Nesirky might have checked it that morning, before being asked. In fact, Nesirky and his Office have allowed dozens of questions ranging from Sri Lanka to budget and contracting irregularities to Sudan to the UN offering free flights to an indicted war criminal to build up without offering answers or even acknowledging the e-mailed questions. Back in the summer of 2010, he publicly swore at Inner City Press. In January 2011, he told Inner City Press he wouldn't answer any more of its questions. Inner City Press said, then and now, that it does not believe Nesirky is doing his job. “This is unacceptable,” Nesirky said, concluding “I'm going to have to bring this up with UNCA,” the UN Correspondents Association. Watch this site. Update: Nesirky and his office have still not provided any answers to the Haiti "amendment," Ban son in law, elevator operator or other questions, 19 hours after Nesirky said he would get the Haiti answer. At least this is what Ban's spokesperson's office e-mailed out to the Press at 6:56 pm on March 16. Did Ban's expectation for “roughly half the rubble” change overnight? The new version was labeled “amended,” as if Ban and his remarks were a Constitution or draft resolution such as the one on Libya Ban was missing during his Central American foray. 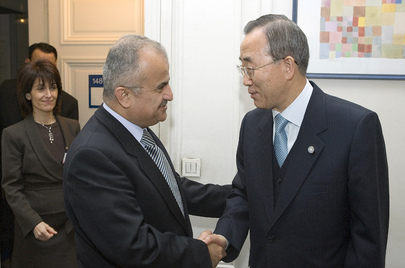 Ban & his Libya envoy al-Khatib in 2007: who's underestimating? Earlier on March 16, Inner City Press had asked Ban's spokesman Martin Nesirky for the UN's response to criticism published that day in The Lancet, saying that the UN had under-estimated Haitian cases of cholera by nearly 100%. Both are just estimates, Nesirky replied reading from notes. So what was wrong about the estimate about “roughly half the rubble” that Ban reportedly said in Guatemala City? Watch this site. Update: on the UN's panel on cholera in Haiti, and its causes, Inner City Press on March 16 asked Nesirky when the report will finally be ready, and if it will be public. Late March or early April, he said, and yes. We'll see. Ban in another foray this year, to Los Angeles, did a "Facebook townhall meeting" about Haiti with the band Linkin Park in which cholera in Haiti and its causes were barely discussed. In a recent interview, Mike Shinoda of Linkin Park explained the session: "we got an email from the UN. 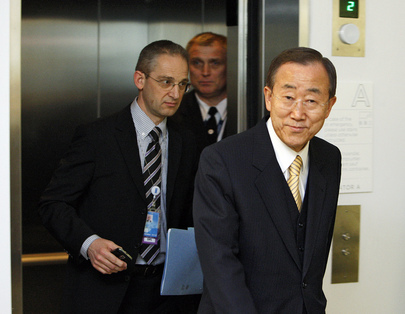 They were asking if we wanted to do a meeting wiht the UN Secretary General Ban Ki-moon." With Libya on fire, and Haiti under-estimated, who is Ban e-mailing now?